I’m addicted to SimCookie’s First Snow mod, especially since it’s been updated for Get Together to include Windenburg. There isn’t any gameplay added, it’s purely aesthetic but oh how beautiful it is! Especially as there doesn’t seem to be any prospect of snow, let alone even a frost, this winter in RL. I may be reading it wrong but I’m sure that the latest version of this mod is meant to add snow to a roof although none of my houses have any. Talking about Windenburg, am I the only one who thinks that the houses look far too chocolate boxy? They’re like a caricature of themselves. It’s like walking around a Disney designed Bavarian street in Elizabethan times on acid. I love the ability to raise and lower objects using CTRL + 9 or 0 in The Sims 4. It’s a very cool little addition to using MOO. 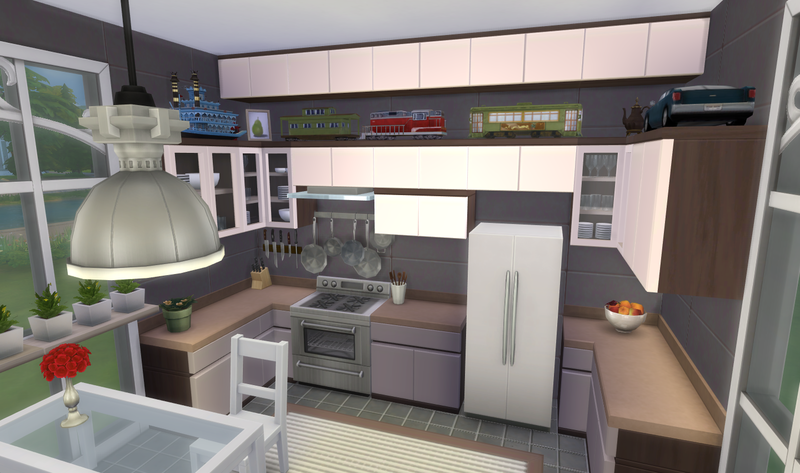 I used it on the shelf of plants in this picture because they couldn’t all be placed properly: As soon as I used the higher wall heights in building I thought how cool it would be to add stuff on top of the cabinets. In my kitchen in RL my kitchen cabinets have wicker baskets stored on top of them and they look so lovely. I started adding objects using CTRL + 9 but when you zoom in and out some objects look like they’re floating in mid air which just annoyed me. I tried placing shelves just below the top of the cabinet but couldn’t get them to place properly either. 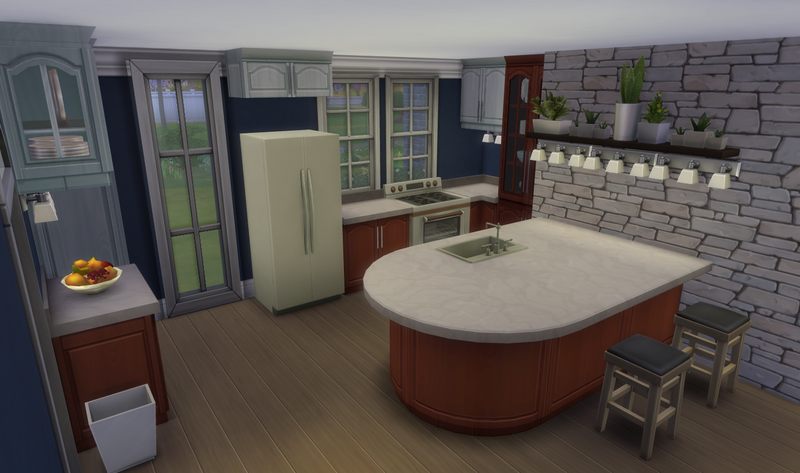 And then today I saw a thread in the TS4 Build/Buy Custom Content forum showing a mod which could add placeable slots to the top of cabinets – Yay! I don’t use any CC in my game and only have one mod, Shimrod101’s No Blur in the Distance one for getting rid of EA’s stupid blurry backgrounds. I like my clean and hassle free game. But I couldn’t resist this cabinet one and got straight to work adding trains, cars and boats to the top of my cabinets: I think they look great. You can download _orangemittens_ fabulous mod from The Sims 4 Studio here.